We are pleased to send you our quarterly eNewsletter for October - December, 2014 with some information about the latest developments in the debate over Article 9 in Japan, as well as some of the Global Article 9 Campaign recent activities. On December 14, Japan held snap national elections, which outcome granted Prime Minister Abe Shinzo's Liberal Democratic Party and its junior ruling-coalition partner, Komeito, a landslide majority that guarantees Abe a new term as Prime Minister of Japan. With elections claimed to be a referendum on Abe’s economic policy, the campaign eluded controversial debates such as those on the revision of the Constitution, restarting nuclear plants and the new state secrets law. Yet, it makes no doubt that, now with a strong majority of more than two-thirds in the Lower House of the Diet, Abe is determined to go ahead with his long-held plan to rewrite Japan's pacifist constitution. Indeed, in a press conference following the election results, Abe confirmed that he plans to take steps toward his goal of constitutional revision. "To amend the constitution has been our party's long-cherished wish since its establishment," Abe said. "We will emphasize the need to amend the constitution and make efforts to see growing public debate on the issue." He further promised to work on national security legislation in the next Diet session. In July, Abe’s Cabinet approved a reinterpretation of the constitution to allow Japan to participate in collective self-defense operations and authorize the use of force abroad under certain circumstances. The decision still needs to be incorporated within more than a dozen laws – a process deemed to take place after local elections in April 2015. Although Abe can rely on a consolidated majority in both houses of the Diet, it cannot be ignored that voter turnout was the lowest since the end of World War II. Further, constitutional revision remains a highly divisive issue at home and regionally. According to a Kyodo survey, more than half of the respondents do not support Prime Minister Abe Shinzo’s handling of security policies. Another public opinion poll by the Asahi Shimbun finds that only 3% of respondents chose constitutional amendment as a policy agenda Abe should purse in his third term (against 33% citing social security and 30% the economy and employment). At the international level, if Japan’s neighbors, notably China and South Korea, are increasingly wary of Japan’s changing security posture that they see as a path toward militarism and historical revisionism, the US sees it from a different perspective. Indeed, Washington has long prodded Tokyo to become a “full partner” in the Japan-US alliance and to play a greater role in the US “Pivot to Asia,” reprobating Japan’s self-imposed ban on collective self-defense as “an impediment to the alliance” – and more generally Article 9’s restrictions as “anachronistic constraints” that should “be eased.” Yet, the long awaited revision of the U.S.-Japan defense guidelines – initially due by the end of this year – has been delayed until early 2015. In an interim report released in October, however, Japan and the U.S. said the new guidelines will “appropriately” reflect Japan’s reinterpretation in July of the war-renouncing Constitution to enable the exercise of the right to collective self-defense, or defending allies under armed attack. During the first months of 2015, the debate on constitutional amendment – and specifically on changing Article 9 – promises to be on top of the Japanese political agenda. Saving Article 9 will require an important, determined mobilization of those in Japan, in the region and abroad who want to preserve peace. Read a Global Article 9 Campaign’s article analyzing Abe's reinterpretation of Article 9 in the context of the U.S.-Japan security cooperation and Japan's rising nationalism here. On 8-9 December 2014, the Third International Conference on the Humanitarian Impact of Nuclear Weapons was held in Vienna, Austria, as a follow up to two prior meetings that took place in Oslo, Norway and Nayarit, Mexico. 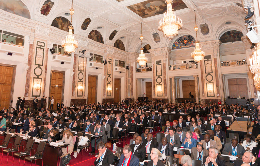 158 states gathered at the famous Hofburg Palace – including for the first time, delegations from the US and UK – as well as more than 300 representatives of international organizations, civil society including parliamentarians, and academia to examine the consequences of nuclear weapon use, whether intentional or accidental. In addition to statements by Pope Francis, UN Secretary General Ban Ki-Moon and President of the International Committee of the Red Cross Peter Maurer, survivors of nuclear bombs and tests in Japan, Australia, the US and the Marshall Islands gave powerful testimonies, and experts presented data and research on the devastating and long-lasting effects of nuclear weapons, their associated risks, as well as on the norms under existing international law pertaining to their humanitarian consequences. The evidence-based discussion was followed by more than 100 statements by governments and civil society. Among them, a number of governments explicitly called for a prohibition of nuclear weapons. Likewise, the International Campaign to Ban Nuclear Weapons (ICAN), which represents over 360 organizations in more than 90 countries, called for the start a diplomatic process, open to all and blockable by none, to negotiate a legally-binding instrument prohibiting nuclear weapons. “Anyone in Vienna can tell that something new is happening on nuclear weapons. We have had three conferences examining their humanitarian impact, and now with the Austrian pledge we have everything we need for a diplomatic process to start”, said Thomas Nash of UK NGO Article 36. Immediately preceding the Austrian conference, ICAN held a Civil Society Forum, where 600 campaigners from over 70 countries, representing more than 100 different organizations on the courage to ban nuclear weapons. Immediately following the Conference, the 14th World Summit of Nobel Peace Laureates was held in Rome. The Nobel Peace Laureates also issued an explicit call for a ban on nuclear weapons. Download all Conference proceedings and outcome documents here. Find a general report (and links to pictures) of the ICAN Civil Society Forum on here. Also view ICAN's video presented at the government conference. On 10 December 2014, the launch of the new, permanent, global, year-round Global Campaign on Military Spending (GCOMS) was announced at the Future of Human Rights Forum event entitled 'Divest from War: Invest in Our Future' at the UN in Geneva. The campaign builds on over a decade of work done by the International Peace Bureau, the Global Article 9 Campaign and many others around the theme of ‘Disarmament for Sustainable Development’. Seeking to tackle the worldwide issue of excessive military spending, GCOMS incorporates the Global Day of Action on Military Spending (GDAMS). For its 5th year, GDAMS will be held on April 13, 2015. On October 10, the Global Article 9 Campaign held a public viewing of the Nobel Peace Prize Award announcement at its secretariat in Peace Boat's headquarters in Tokyo. More than 100 people gathered to watch the live announcement from Oslo. Article 9 – or more precisely the Japanese people who conserve Article 9 of the Constitution – were nominated for this year’s prize. As the Nobel announcement approached, a number of major media had featured Article 9 among the top contenders for the prize. It is indeed the people of Japan who express pride in Japan’s constitution as a peace ideal and have come in support of preserving war-renouncing Article 9 against repeated attempts to curtail its scope and overstep its restrictions. Although not selected as the Laureate, the nomination of the Japanese people who conserve Article 9 of the Constitution for the Nobel Peace Prize 2014 has sent a strong signal to the people of Japan, encouraging them to remain mobilized to preserve their peace clause and to demand their government to realize and strengthen the country's peace commitments, rather than weaken them, as is currently threatened under the Abe government. The nomination also attracted international attention to the existence of the war-renouncing clause. It also highlighted the role Article 9 has played as a regional and international peace mechanism that has acted as the foundation of peace and stability in East Asia, and served as a legal framework to promote non-military solutions to disputes, disarmament and a culture of peace. Co-initiator of the Global Article 9 and Peace Boat Executive Committee Member Kawasaki Akira commented, "Although Article 9 did not receive the award this time, I am still delighted that it was considered as a candidate. Article 9's nomination is the expression of a feeling of crisis amid the international community as the current Abe administration seeks to gut Article 9, allowing use of the right of collective self-defence. Article 9 embodies not only for Japan but indeed for the entire world, the principles of building peace without relying on force. Honoring and upholding the spirit of Article 9, it is incumbent upon us to build mechanisms that facilitate not military escalation, but shared peace and disarmament mechanisms for East Asia." The public statement issued by the Global Article 9 Campaign and Peace Boat is available as a PDF in English here and in Japanese here. Also download this media release as a PDF here. 'Could a Brand New Asia be led by Asia?' This question brought together some 400 people from the region, including 20 international experts from Japan, China and fareast Russia during the 10th Hankyoreh-Busan International Symposium held on November 19-20, 2014 in Busan, South Korea. The discussion opened with keynote addresses by Mayor of Busan Suh Byung-soo, former Japanese Prime Minister Hatoyama Yukio and South Korean National Assembly speaker Chung Ui-hwa who, in light of the current and historic regional tensions, called for the creation of an East Asian community of peace. Hatoyama, now head and founder of the East Asia Community Foundation, spoke of the need to build trust and friendship among Asian neighbors. He expressed criticism of Prime Minister Abe’s security policy, notably his decision to re-interpret Article 9 of the constitution to allow the exercise of the use of collective self-defense, as well as his revisionist attitude on historical issues that are keeping the country in a stalemate with countries in the region. Instead, he and other speakers advocated for efforts to be made towards peaceful and sustainable co-existence. The following roundtables and sessions looked at ways to create a peace community in East Asia. Panelists discussed the need to develop cooperation mechanisms, including economic and cultural exchanges, as tools to ease tensions. Kawasaki Akira of the Global Article 9 Campaign presented Japan’s peace clause as an interesting basis to build such a regional mechanism for peace, and highlighted the role Article 9 has played in promoting reconciliation, conflict prevention and cooperation. Korean media, notably the nationwide newspaper Hankyoreh, reported extensively on the symposium, which generated public interest. 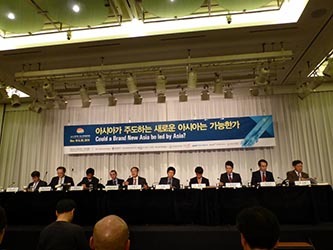 Just a month later, on December 19, a group of prominent South Korean intellectuals (including former Prime Minister Lee Hong-koo and former Chief Justice Lee Yong-hun) started a campaign to support Japanese efforts to continue the drive for Article 9 to receive the Nobel Peace Prize in 2015. The recognition of the value of Article 9 "would serve as an opportunity to advance peace on the Korean Peninsula, in Northeast Asia and worldwide," said a representative. Read an analysis on the role Article 9 can play as a foundation for peace and stability in East Asia: ‘Reclaiming pacifism in East Asia’ by Kawasaki Akira and Celine Nahory published in the Korea National Strategy Institute in English or Korean. Thank you for your interest in and support for the Global Article 9 Campaign to Abolish War. Copyright © 2014 Global Article 9 Campaign to Abolish War, Peace Boat, All rights reserved. You are receiving this email because you are in the Global Article 9 Campaign's Contacts list. If you want to be removed or if you think you have been added by error, please use the UNSUBSCRIBE link below to remove your contact from our database. ©2008 GPPAC JAPAN All Rights Reserved.